Back in 1955, Dr. Emmett Brown predicted plutonium, the element required to power a time machine built into a DeLorean DMC-12, would be in every corner drug store by 1985. He was a little off, but for the writers of the classic Back to the Future trilogy, they had a little room to exaggerate for comedic appeal. 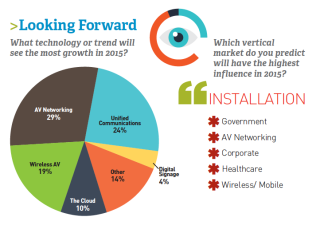 For leaders in the AV Industry, predicting the future takes a little more accuracy. Here at SCN, we wanted to get an idea of where the industry is headed from the people who see it first hand every day—you, our readers. And that’s how the SCN Future Trends Survey started. We took the time to poll readers on various aspects of the industry, from sales, to markets, to revenue, giving readers the opportunity to weight in on how their company has performed over the past year, and how they think the industry will advance in the future. We hope you find value in the following pages as we outline the results of SCN’s 2015 Future Trends Survey.